MV look set to announce the arrival of an RC version of the 800 and 675cc F3 sports bikes. Built in limited numbers, expect to see just 300 made, in a split between the two engine sizes. 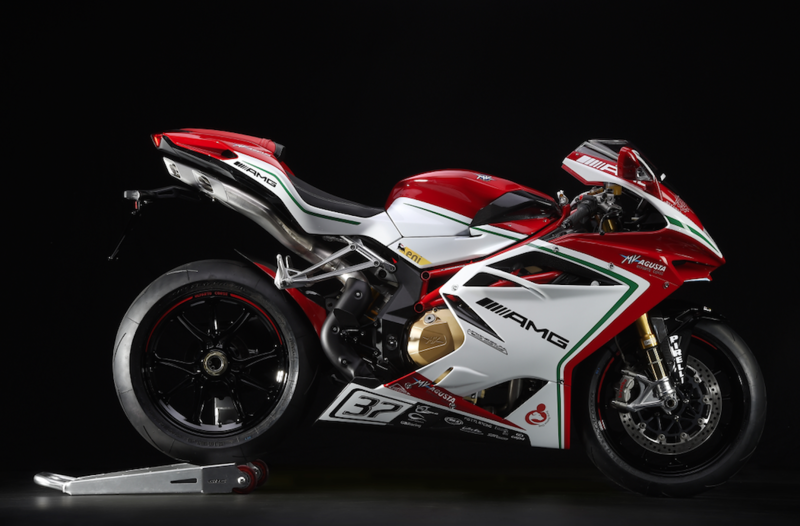 If you’re wondering what the RC fuss is all about, it stands for Reparto Corse (racing department) and links to the MV Agusta F4RC which was unveiled earlier this year. The 1000cc engined F4 version is limited to a run of just 250 units and has been billed as the fastest and most powerful MV ever built. Intake and exhaust duct reshaping, balanced moving parts, an exhaust and ECU upgrade and a host of weight saving helps push peak power from the standard model’s 205bhp to a mind-bending 212bhp at 13,450rpm. Big brother F4RC is a stone cold peach of a bike. Saving weight is the name of this exclusive game. Each bike has a painstakingly Tig welded by hand steel trellis tube chassis, onto which is mounted the adjustable swing arm pivot. Stunning Brembo M50 monobloc calipers are radially mounted and bite into steel discs. All controlled by a radial mount master cylinder, the F4RC truly is a work of art. Finished in the race replica paint, the bike tips the scales at a dry weight of just 175kilos, meaning on the road it’s closer to 210kilos with fuel, oil and ready to ride. What price perfection? To you, sir, a snip at just £31,150. MV are nailing it at the minute, adding stacks of new models and really taking their business seriously. Hopefully that means we can expect properly trick, lightweight versions of the existing 675 and 800 F3. While you wait for yours to arrive, check out this tidy F4RC video.